"Salvation," an early "defining moment" in Hughes' life: What is a "defining moment"? Defining moments are a part of life. At various points along life's journey, we experience situations and circumstances that define us. Defining moments are those times where we are affected and change for better or for worse. It's after those moments that things never are quite the same as before. Those moments can be big or small. It is their effects on us that define us as a result of that moment in time. 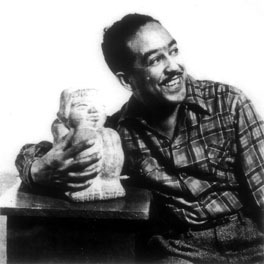 The narrative essay, "Salvation" is excerpted from Langston Hughes autobiography The Big Sea. It is a defining moment in his life. He says things to that effect in his autobiography. We will discuss why it is and how this inident sets Hughes on a track that is very different from his contemporaries, and how taking this "road less travelled" rockets Hughes out of the realm of a "mere literary figure" and makes him a powerfully influential force for change in 20th Century America. Timeline of Langston Hughes' life, #1 ; Timeline #2 of important events in the life of Langston Hughes. A short biography of Hughes from the Kansas Heritage Society. Instructions: Copy and paste everything between the lines below into a M.S. Word document to input your answers. You may use Dictionary.com or Merriam-Websters.com or any other dictionary of your choice to define the terms. Define the following terms as they are meant in the context of the essay. Since this is a writing class, write your answers in complete and grammatically correct sentences--even the definitions. 8. Why can’t Langston tell Auntie Reed the truth about his experience in the church?